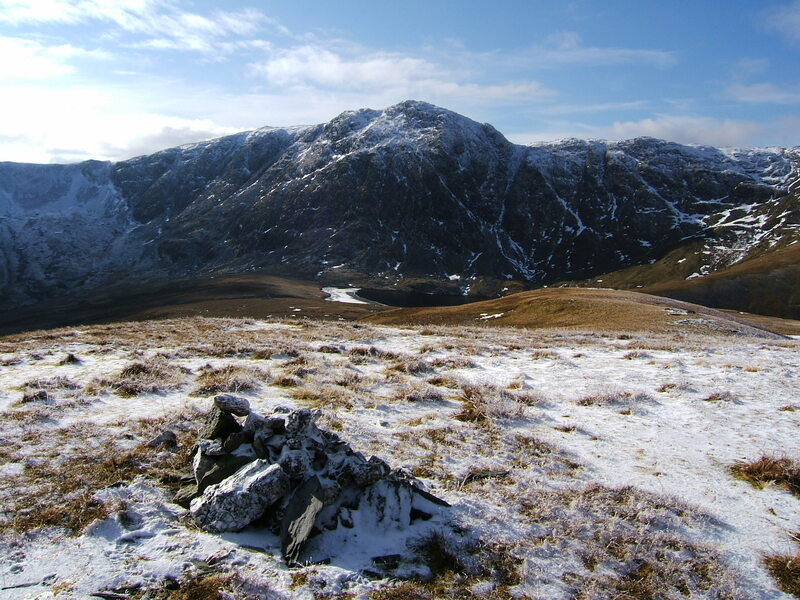 Pen Y Garn is an outlying peak to the south of the Pumlumon range. There is little remarkable about it but it’s a nice stretch for the legs. 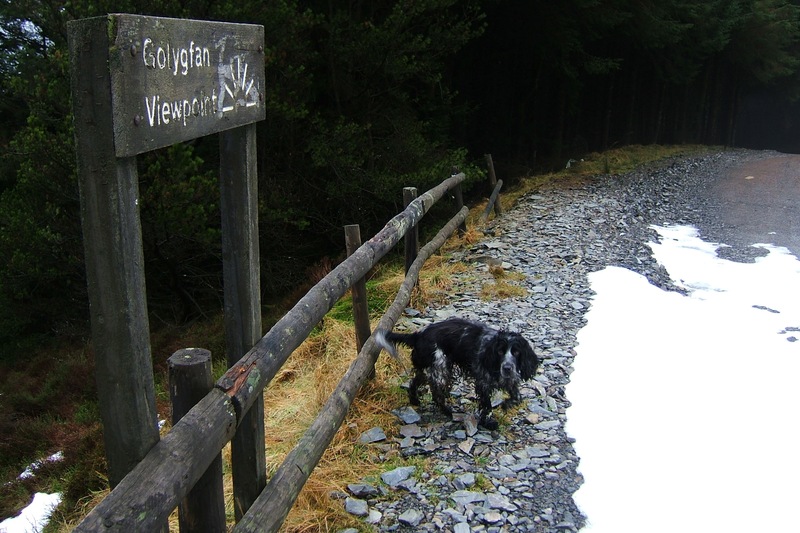 The snow and ice that had covered mid-Wales since before Christmas have now gone, except for a few vestiges on the hills and higher roads, so there were no more excuses, and as the route is mostly through forest it was also a chance to give the dog a good run out. The starting point is the Arch, a 19th century monument by the side of the B4574, a winding mountain road tha t runs across hills and moors from Rhayader to Aberystwyth with fine views over the Elan Valley on the way. From the car park, , a wide forestry track leads up over 2.5 miles to the grassy slopes below the summit. I thought we might make things more interesting by detouring through the forest itself. This was a mistake of course. We did find a clearing with a good viewpoint looking across to the coast and the hills to the north but then had to struggle through rough forest paths to get back on the main track. We probably took the least direct route through the confusing mix of fences around the summit and by the time we got there we were surrounded by a thick and very cold fog. The summit itself is now the site of a number of several large wind turbines, an eerie presence in the mist. After a quick (shared) sandwich, we foll owed the path south from the summit and then onto a track that took us all the way back to the edge of the forest. The only mishap was going into a mound of snow up to my thigh. Passing an old farm house in the middle of the forest, the farmer told me that a week or so before the snow had reached over the top of the farm gate. Now there was just enough snow left on the sheltered parts of the hills to make an attractive piebald patterning across the slopes. From the farm it was an easy walk back through the forest to the car and then an enjoyable drive home over the mountain road. A good way to shake off post-holiday, mid-winter lethargy and bag another summit at the same time. The last weekend before the clocks change seemed a good time to do a long walk and before we came to the end of a spell of fine autumn weather. The target was the 11 peaks that surround Cadair Berwyn, a 10 mile walk based on the Nuttall route with the addition of Cadair Bronwen. 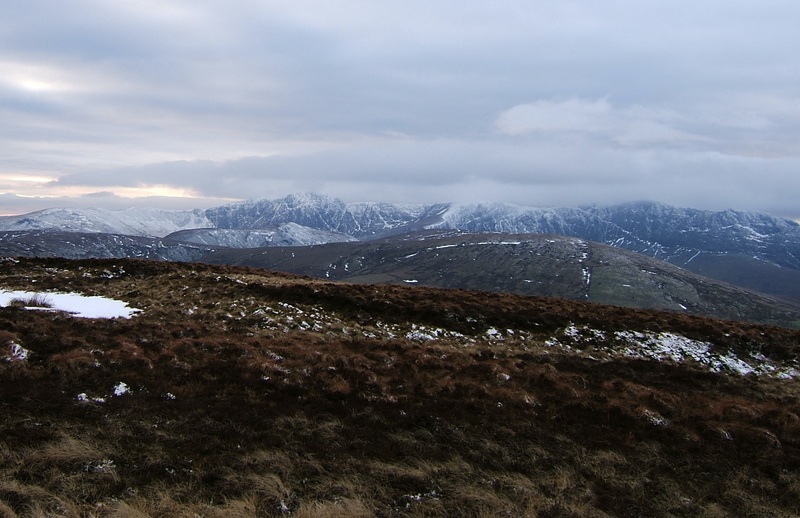 This is a fine ridge walk particularly the highest section from Cadair Bronwen over Cadair Berwyn and on to Moel Sych. Much of th e rest of the walk is across moors and rolling hills covered in heather and bracken (dying away now). It’s boggy in places but there is only one section that involves a real heather-hopping bog trot. I grabbed the last tiny parking space at the bridge (SJ 118306) on the minor road above Llandrhaeadr-ym-Mochnant. After walking through the farmyard at Maes (greeted by a couple of enthusiastic but friendly enough farm dogs), the stiff climb began alongside a wood to the top of Mynydd Tarw. This was a pretty hard slog up the steep grassy slope but it got the toughest climbing of the walk out of the way. From the cairn at the summit of Mynydd Tarw there are good view east over Cheshire and Shropshire. It was a straightforward walk from here across the twin peaks of Foel Wen and on to Tomle. I should have had fine views of Cadair Berwyn ahead of me, but disappointingly a thick mist hung over the high tops. From Tomle, there is a clear path up to main ridge but I took the alternative track about half way to the inviting peak of Cadair Bronwen. At the top there were clear skies to th e north and east, but the mist was growing heavier over Cadair Berwyn and spreading towards me. It looked like the rest of the walk would be in thick cloud. 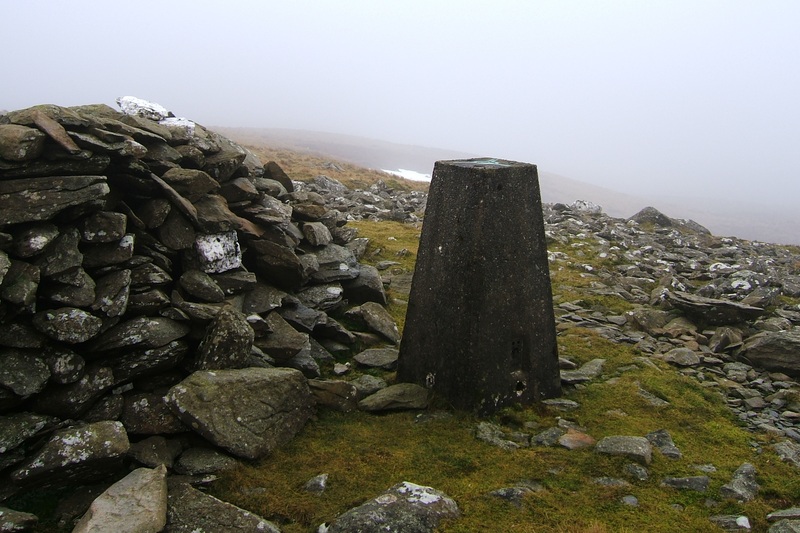 Things hadn’t improved as I reached the trig point on Cadair Berwyn. The rocky outcrop to the north, now recognised as the highest point in the range, was barely visible but by the time I’d reached it the mist had begun to clear. This is a more dramatic peak than the trig point, with a dramatic fall away to the valley below and good views across the Berwyns and the hills of Snowdonia. I then had a gentle stroll over boggy moorland to Moel Sych. The weather continued to improve and I had at least a hazy view around the hills of mid-Wales, the Arans, the Rhinogs and the Arenigs. On a completely clear day the view would be magnificent. From Moel Sych the descent is via a narrow path beneath Cadair Berwyn and across Moel yr Ewig. This was easy walking along moorland paths except for a section after Moe l yr Ewig, which involved some strenuous heather-hopping, never fun on tired legs. It got easier though as I reached the non-descript north-west top of Godor. A little further on is the main summit of Godor, which gave a good view of the complete horseshoe. From there it was a straightforward walk down the ridge and through fields to the track that took me back to the road. Like Moel Siabod, I chose this walk with the poor (and accurate) forecast in mind. We hoped we had w aited out the wind and rain in the morning, but as we left the car park at Llyn Ogwen the rain started again. It grew heavier as we walked up the well-maintained track to Llyn Idwal. At least it gave T a chance to test his investment in decent boots and waterproofs. On the way up we passed a succession of returning walkers soaked to the skin (literally in some cases). Some had been caught out on what should have been a pleasant stroll around the lake, others were coming down off the mountains, and at least one suggested we might want to think again. We decided to go at least as far as The Devil’s Kitchen – the rocky chasm that provides access to the pass between Y Garn and Glyder Fawr. As we stopped for lunch at the beginning of the steepest part of the climb, the rain eased up but I was as concerned about the wind as the rain. It was supposed to be gusting up to 70 mph on the tops, though it was fairly calm in the sheltered bowl around Llyn Idwal. We carried on up the rocky ascent, passing several groups of descending walkers coming off The Glyders or Y Garn (who’d presumably been waiting for the break in the weather). By the time we had reached the plateau at the top of The Devil’s Kitchen, the wind had eased, though it was still strong on the exposed sections. The clouds had also cleared and as we walked up to the summit of Y Garn there were fantastic views of Tryfan and the Glyders as well as the Snowdon and Carneddau ranges. We then walked down the steep eastern face of Y Garn back to Llyn Idwal with the sun setting as we reached the end of the walk. There is something about a w alk done in the face of the elements that gives you a sense of achievement (and if the sun comes out at the end to dry you off even better!). And though the mountains can throw much worse that this at you, it still felt like a good test. Next time it has to be Tryfan and the Glyders. Moel Siabod is a prominent and isolated peak at the edge of the Moelwyn range in Snowdonia. It is climbed via a straightforward route made more interesting by an easy and very enjoyable scramble to the summit. We didn’t start until after lunch and by the time we got to the parking place on the road to Capel Curig the mist was thickening. The summit was glimpsed for a few seconds as we left the car park, but that was the last time we saw it until we reached the top. The gradual ascent was pleasant and undemanding until we reached Llyn y Foel. The lake was sombre place in the mist, lying below the cliffs of Moel Siabod with the main ridge rising from the far end then disappearing into the clouds. The surrounding hills were little more than fleeting, shadowy presences. From here we started the ascent of the ridge, which quickly become as interesting but safe scramble. The mist thickened as we climbed and by the time we reached the summit we could see only few metres ahead. The wind was also much stronger and colder on the peak, so I just took a couple of photographs and then we beat our retreat. A little care was needed in the mist to make sure we kept in the right direction down hill but there were no real problems. As we descended into the valley the winds shifted the clouds to allow glimpses of the previously hidden valley below. As the forecast for the next day was even poorer, it was good to get this walk under our belts. A pint and a steak pie in the Cwellyn Arms at Rhyd-Ddu was a fitting reward. These are two of the most accessible hills in the Black Mountains but they provide won derful views. Skirrid, Ysgyryd Fawr or Holy Mountain as it also known, has for hundreds of years inspired a host of intriguing myths and tales. I was with G, and we began with Sugar Loaf, walking up from a car park on the Abergavenny side. The paths are wide and easily followed (though we still managed to wade through bracken after missing the track while talking). The hill’s isolation provides excellent views, particularly over to Waun Fach and Pen y Gadair Fawr. The weather was fine but cloudy and there was a chill in the wind on the summit of Sugar Loaf, but by the time we got to Skirrid (after a relaxing pint at The Bear in Crickhowell), the sun had broken through. Skirrid is a shorter and steeper climb but the views are as good if not better than from Sugar Loaf. As we climbed along the distinctive cloven ridge to the summit, the Black Mountains provided a wonderful backdrop beyond the summit. From the summit itself, we looked back as far as the Severn to the south east as well as over Sugar Loaf to the Brecon Beacons. A few stones are all that remain of the old chapel at the summit, but they add to the sense of this being a rather special hill. Black Mountain is the confusing name given to the area enclosing the impressive range of hills that lie at the western end of the Brecon Beacons National Park. The high points of Fan Brycheiniog and Bannau Sir Gaer are as impressive as any part of the Brecon Beacons. I started from the car park opposite the Tafarn-y-Garreg pub (which seems to be closed at the moment). The walk starts with a strenuous but gradual climb up grassy slopes and the escarpment edge to Fan Hir. 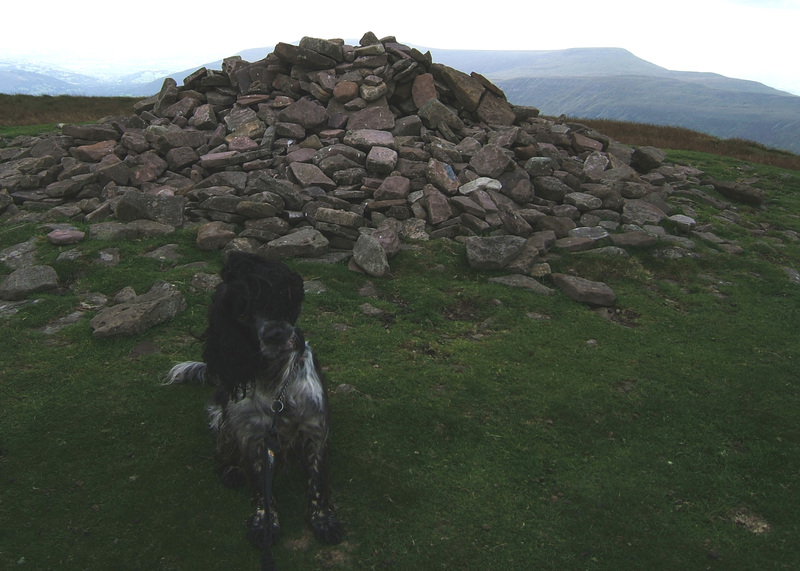 The summit is unmarked but the views across the Brecon Beacons are impressive, with the grey forms of Pen Y Fan and Corn Du in the distance. The path then follows the escarpment edge and the climb to Fan Brycheiniog. 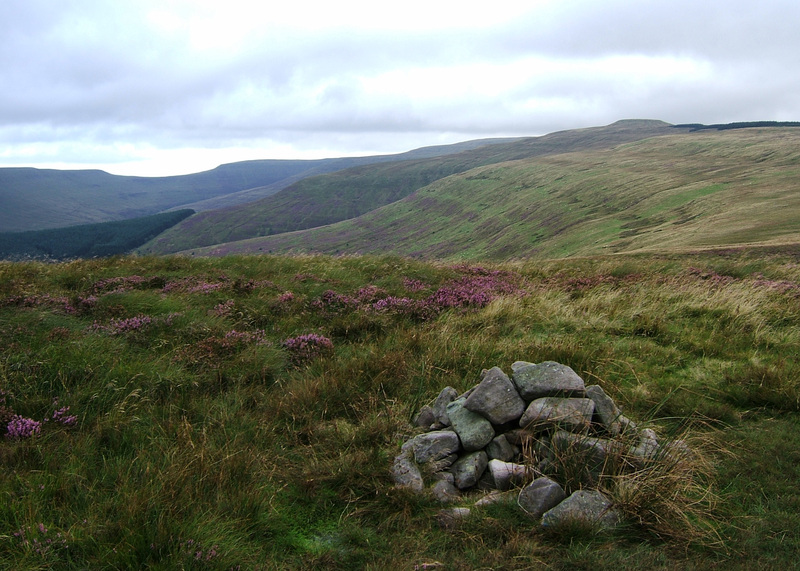 The summit of Fan Brycheiniog, the highest point in the walk, is marked by a trig point and a sturdy stone shelter. 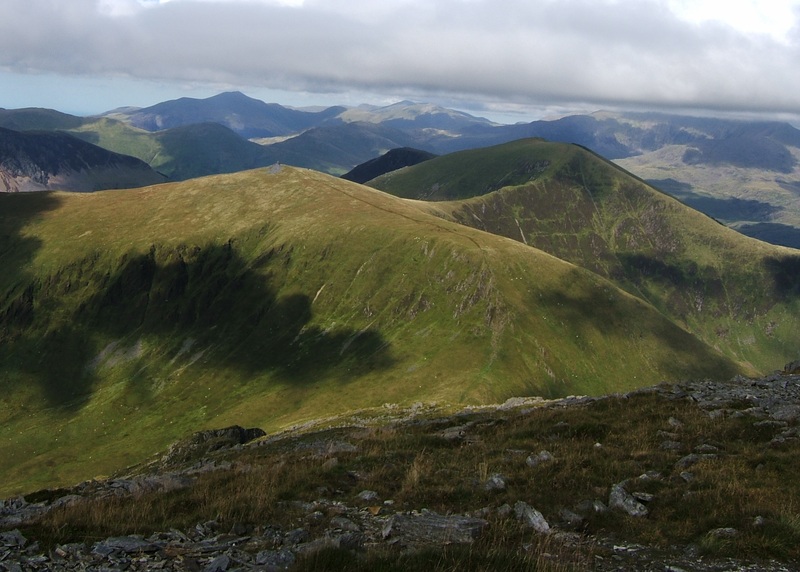 It is then worth following the path around the ridge to the lesser peak of Fan-Foel for more fine views back along the escarpment and out to mid-Wales. The impressive ridge of Bannau Sir Gaer also becomes clear now, with Llyn y Fan Fach lying below. It is a stiff climb up to the highest point – Picws Du – the ridge then follows around to Waun Lefrith. Llyn y Fan Fach is associated with a legend of the Lady of the Lake, which then links to tales in the Mabinogion. Though this is the remotest part of the park, there were more walkers on the peaks than I usually see, but even these few faded away once I’d moved on from Bannau Sir Gaer and for the rest of the walk I was totally alone. I went on, following the Nuttall route, to Garreg Las. Crossing the moorland I disturbed a snipe that took off out of the grass with a cry of annoyance more than alarm. Garreg Las, with its two huge cairns, is a rocky outpost that marks the change into a limestone landscape of rocky outcrops, shake holes and swallow holes (and the caves of Dan-yr-Ogof). This is a long loop back – the walk is around 14 miles in total – but gives a fine end to the walk, particularly on a fine September day with the sun finally beating through the clouds. Cadair Idris was a fitting walk for my 60th Welsh summit. I took the Minffordd track via Cwm Cau and Craig Cwm Amarch up to Penygadair, the highest point in the Cadair Idris range. I then looped back via Mynydd Moel, with short spurs off to incl ude Cyfrwy and Gau Graig. It was an incredible September day, with mostly clear skies and strong sunshine, so as well a clear site to down to Barmouth on the coast and across Pumlumon, you could see out across the mid-Wales hills and up to the Lleyn Peninsular, the Rhinogs and Arans and in the distance the far peaks of Snowdonia, while Ireland was a faint outline on the horizon. As the route is so well known, I was going to use this as an opportunity to reflect a bit more on the experience of hill-walking and the beauty of mountains. But the day provided its own focal point for thinking. As I came down the path from Craig Cwm Amarch across the ridge that steeples down to Llyn Cau – a still, tropical blue mirror below – I came across a group of people on the path. At first I thought they had just stopped for a break but then I realised that a man was lying down and being cared for. My first thought, or hope, was that it was just a fall, a bruised knee or strained muscle, but someone was already trying to resuscitate him and people were obviously distressed. Fortunately the two walkers behind me were doctors and they took over the attempt at resuscitation but it already looked unlikely as there was no pulse and he had been down for 10 minutes or so. Someone had already reached the mountain rescue service and a helicopter was on its way. There was nothing I could see to do and so I and some others moved on, reassuring each other that that was the best thing. At the top of the bwlch before splitting off to Cyfrwy from the main route up to Penygadair, I took a break. Watching back to the ridge I could see the group around the fallen man, anxiously waiting for the helicopter. Then I heard the slow thumping deep sound of blades and a helicopter appeared from the east but passed straight overhead towards the sea, then behind me I heard a much louder noise and a bright yellow RAF helicopter rose up from behind the ridge. It headed over the valley towards the accident but then circled without landing. In fact it had dropped the necessary equipment but, as another walker told me, the man was already dead and they were only retrieving the body. There was a sense of sadness but also a sense of nothing being left undone. He hadn’t died from lack of medical attention, nor from a mistake. He had gone quickly on the hills on a beautiful day. It was tempting to think that this was not a bad way to go. Not a consolation anyone would have offered his wife then but one that his family will have drawn on in the days to come. And all the rest of us could do was carry on walking. 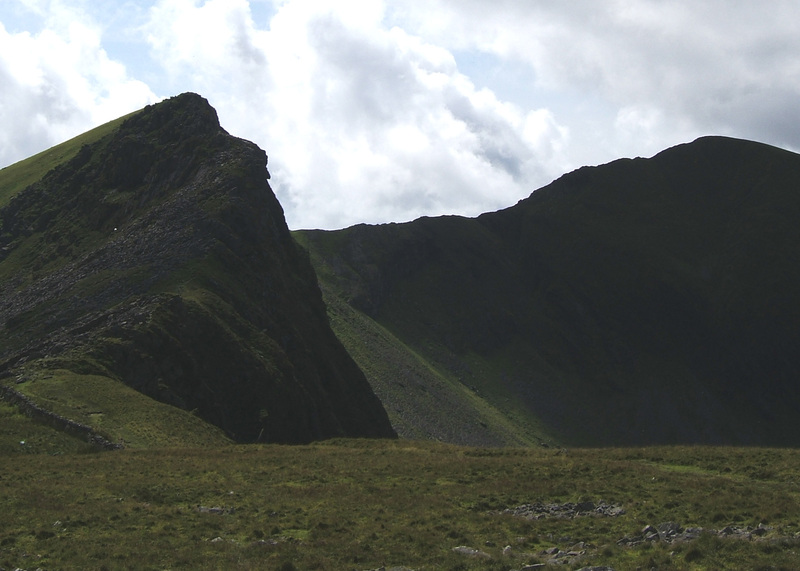 I trekked on to Cyfrwy with its clear views of the cliffs running down the north face of Cadair. Then onto the summit of Penygadair, where two groups of teenagers were joking, testing themselves, flirting. That felt appropriate too. And then they moved off and for a while I had the summit to myself, to sit and just look at the immense stretch of hills on all sides. Then it was on to Mynydd Moel. This is a easy walk over from Penygadair and the good views continue from the edge of the ridge. As I left the summit I heard the beat of a raven’s wings behind me, but this was not the usual solitary pair but six birds that gathered for a few minutes over the summit. I watched them wheel over the summit in a silent ballet, punctuated only by the occasional craw and soft beating of wings. After a minute or two they split into two groups, two flying westward and the rest going south with a final croaking cry. From there it was a short bog trot out and back to the outlying peak of Gau Graig. Then back down over heather and a steep track to rejoin the Minffordd path. The sun was just dipping behind the rocks of the ridge as I descended at the end of a beautiful day and thought provoking day. This was unfinished business. Both peaks are probably best walked as part of the long Nuttall walk taking in the seven sum mits starting with Pen Carreg-calch and passing round to Waun Fach and then on to Pen Y Gadair Fawr and Pen Twyn Mawr. I walked the other side of the valley in the winter, but I didn’t have time to do the whole loop, so instead I started from the Grwyne Fawr valley. The biggest benefit of this approach was to give Izzy, our spaniel, a good work out by taking a winding path up through the forest. This was a good way up (as long as you don’t mind getting a bit lost in woodland). It’s then a simple climb up to the summit of Pen Y Gadair Fawr. This is a better peak than the higher – and very boggy – Waun Fach. There are excellent views across the whole of the Black Mountains, even on a cloudy day like this. The wind was bitter for August though, so we moved quickly on to Pen Twyn Mawr skirting the forest at first then across a clear track to the summit. From cairn marking the summit, there are good views down to Sugar Loaf and Skyrrid. I’d hoped to return by going down through the forest but couldn’t see any clear entry point so we back-tracked on a slightly lower path to the forest below Pen Y Gadair Fawr. Just before we entered the forest, a fox ran out of cover about 30 metres ahead, it ran across the path with a rangy gait and then disappeared into the high moorland grass. After that we passed through the edge of the forest emerging on the path that runs steeply down by the forest edge and then follows the river to valley bottom and a short walk back to the car. This was a superb 9 mile linear walk from Rhyd-Ddu to Nebo across the seven summits of the Nantlle Ridge, including Wales’ ne west mountain. The weather was perfect, one of the best days I’ve had in Snowdonia, with the summit of Snowdon itself visible for most of the day. The walk begins with a stiff climb up from Rhyd-Ddu to the summit of Y Garn. There are fine views towards Moel Hebog to the south east. 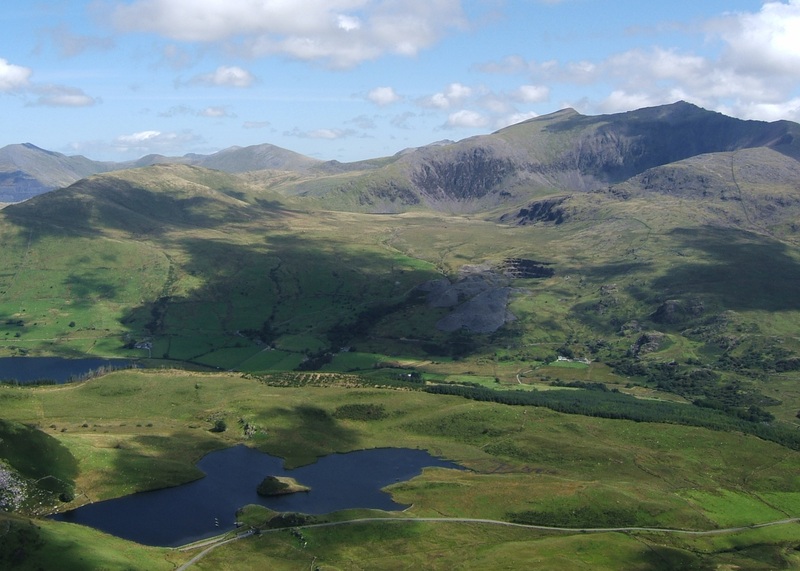 The summit itself gives great views of Snowdon towering above Rhyd-Ddu. To the south the ridge of Myndd Drws-y-coed and the bulk of Trum y Ddysgl, the next two peaks, look daunting. The summit of Myndd Drws-y-coed is reached by a scramble that is made more challenging by the dramatic exposure on the right hand side, but once a sensible route is found towards the middle and left of the ridge it’s an enjoyable climb. From here you follow the ridge to Trum y Ddysgl, though we took the slightly lower route by mistake and then walked back to the summit. From here the ridge continues to Mynydd Tal-y-mignedd, with its stone monument to Queen Victoria. From here the ridge become a steep ascent to Bwlch Dros-bern, with what looks like a rather formidable approach to Craig Cwm Silyn, the tallest of the summits on the ridge. Once you get to the beginning of the climb the path round the right hand side become clear and while stony and steep at times offers no real difficulty. Cloud had started to gather on the top of Snowdon, a familiar picture, but was still above the other peaks. As we followed the stone wall to the top of Garnedd-goch, the skies continued to darken but it was still a fine day. From the top we could see down to Nebo, but we had one more peak still to do. 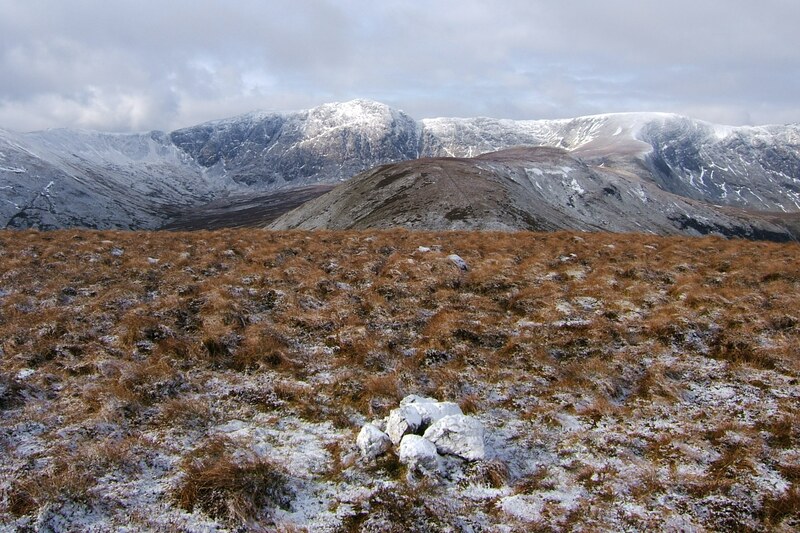 Mynydd Graig Goch was only recently recognised as mountain, after a new survey put its height at just over 2000 feet. The rocky summit was an atmospheric point to end the ridge part of the walk, with the clouds starting to drop over the top of Craig Cwm Silyn. On the descent to the lake below, Cors y Llyn, the clouds were coming over Myny dd Graig Goch, but our luck held out and we made it back to the car tired but dry. We’d been out 9 hours and an excellent dinner at the pub in Rhyd-Ddu seemed well earned.